Grumpy DBA: SQL 2008 - Where did Surface Area Configuration go?! SQL 2008 - Where did Surface Area Configuration go?! No sooner had we got used to opening the oddly titled "Surface Area Configuration" tool to change certain options on SQL 2005 servers that used to be on the properties tab in SQL 2000 (e.g. enabling xp_cmdshell), than it has moved again. SQL 2008 brings us a new description of these items, and we must now call them a "Facet" ... and no, that's not another name for a tap. However, on the plus side, you can now access these through the 2008 Management Studio. 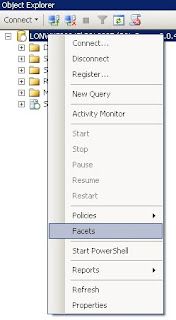 Simply right click on your server name in the object explorer pane, and select "Facets" from the context menu. This brings up the "View Facets" display. From here you can select "Surface Area Configuration" from the Facet drop down menu, and enable or disable your required options directly from here. The other good thing ... this also works for SQL 2005 servers, whereas alternative methods for doing this (e.g. Policies) don't.